Updated 7/6/2017 – Starz finally made it official and announced their Outlander panel and who is attending. It was previously known that the panel will be on Friday, July 21, in Ballroom 20 at 5 PM. Sam Heughan (Jamie), Caitriona Balfe (Claire), Tobias Menzies (Frank/BJR), Sophie Skelton (Brianna), Richard Rankin (Roger), author Diana Gabaldon, executive producer/showrunner Ronald D. Moore, and executive producer Maril Davis will all be on the panel. Actress/dancer Jenna Dewan-Tatum will be moderating the panel. There will also be autograph signing on Saturday, July 22. 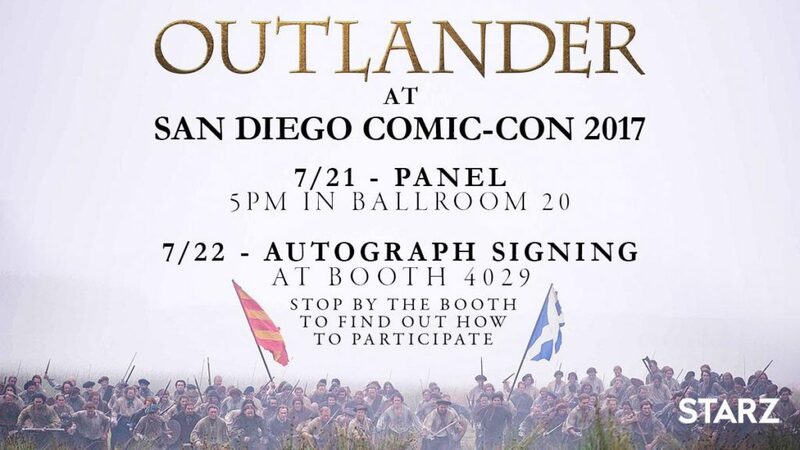 You will need to visit the Starz booth on the Comic-Con floor on Thursday and Friday to participate in the lottery to win a spot at the signing. The time for the signing on Saturday has not been announced or who from the panel will be there. More details on Richard Rankin‘s participation in the Brave New Warriors panel has also been revealed. The panel is in Ballroom 20 at 1:45 PM and will be moderated by EW’s Lynette Rice. The other men joining Richard will be Westworld’s Rodrigo Santoro, American Gods’ Ricky Whittle, Stranger Things’ David Harbour, Happy!’s Christopher Meloni, and Once Upon a Time’s Colin O’ Donoghue. Ronald D. Moore will be on a Battlestar Galactica reunion panel that takes place on Thursday, July 20 at 2:30 PM in Ballroom 20. Graham McTavish (Dougal) will be on the Preacher panel in Hall H on Friday, July 21. (Updated 6/29/2017) – The Outlander panel is in Ballroom 20 from 5-6 PM on Friday, July 21. So if you are going to sit through Ballroom 20 all day, you will see Richard Rankin on his panel earlier in the day. Right now, the other panels in Ballroom 20 that day are iZombie, Psych, The 100, and The Gifted (which has it going to 5:45 PM which would not work with Outlander being 5-6 PM. I believe they meant to write 4:45 PM). (Updated 6/26/2016) – It was announced today that Richard Rankin (Roger) will be a part of the “Brave New Warriors” panel on July 21st. This means he will definitely be there for Outlander panel (on whatever day it is scheduled for). Maybe Sophie Skelton (Brianna) will be there also. Along with the announcement of Outlander season three premiering in September 2017, there was also the bonus announcement of the return of Outlander to San Diego Comic Con (SDCC). Outlander was not at SDCC 2016 since season two had just ended and they had nothing new to show or promote. But now with the September premiere, fans that are lucky enough to attend will be able to see the panel and probably some footage of season three in July 2017. SDCC is being held July 19-23, 2017 and to try and attend you must sign up for a Member ID on the SDCC website. Announcements of when badges go on sale will be emailed to you after you sign up for an ID. San Diego Comic-Con Unofficial Blog is also a great resource for those wanting to find out about news and the process of attending. Outlander TV News will definitely be attending, so we hope to see Outlander fans there! Beverly Hills, Calif. – February 15, 2017 – Today Starz, in association with Sony Pictures Television, announced that season three of the Golden Globe® nominated series “Outlander” will return in September 2017. The third season will include 13 episodes based upon Voyager, the third of eight books in Diana Gabaldon’s international best-selling Outlander series. In March, production and filming on the current season moves from its home base in Scotland to Cape Town, South Africa, to shoot pivotal sea voyage scenes on the former sets of the STARZ original series “Black Sails.” Production on the season began in September 2016 and will wrap in June 2017. 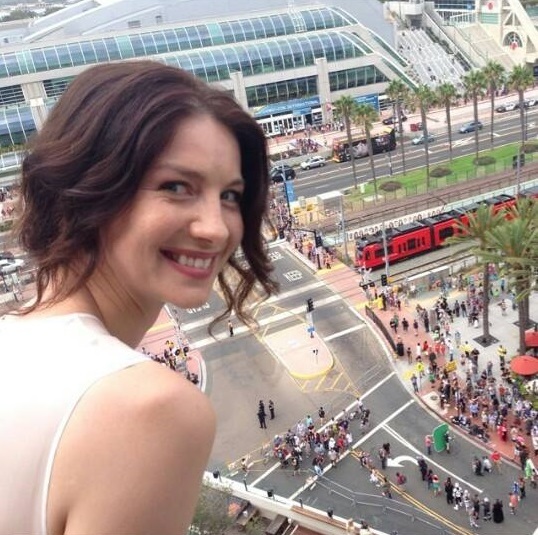 “Outlander” will attend San Diego Comic Con again this summer, offering fans a chance to experience more of this beloved series in person. This entry was posted in Caitriona Balfe, Diana Gabaldon, Graham McTavish, Maril Davis, Richard Rankin, Ronald D. Moore, Sam Heughan, SDCC, Sophie Skelton, Tobias Menzies, TV Show News and tagged Caitriona Balfe, Diana Gabaldon, Graham McTavish, Maril Davis, Richard Rankin, Ronald D. Moore, Sam Heughan, SDCC, Season Three, Sophie Skelton, Tobias Menzies by Sarah Ksiazek. Bookmark the permalink.